[Jesus said,] "And as Moses lifted up the bronze snake on a pole in the wilderness, so the Son of Man must be lifted up, so that everyone who believes in him will have eternal life." 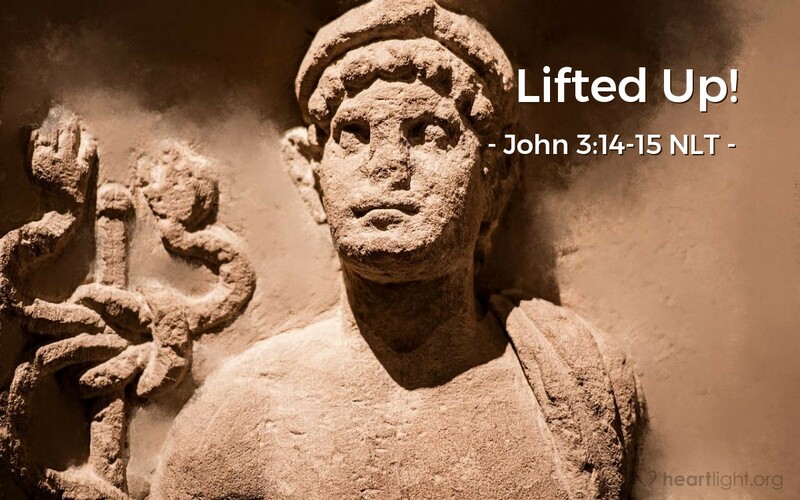 The Greek word for "lifted up" usually means "exalted" in the rest of the New Testament. In a way, it also means that in the Gospel of John. However, when Jesus speaks of the cross, "lifted up" refers to his crucifixion. For Jesus to be exalted to the highest place means that he submitted himself to being lifted up to the worst of places, the cross of Golgotha. Why would he do such a thing? To follow the will of the Father! To set an example for us! To draw all people to himself! To bring redemption and eternal life to us! The cross is both a despicable place of cruelty and shame and also a place of salvation and glory. We exalt Jesus because he was lifted up on the cross for us. Father, thank you for your grace demonstrated in Jesus. Thank you, dear Savior, for going to the cross and enduring its horrors and shame so that I could be saved. I exalt you, Lord Jesus, for your grace and mercy. I exalt you, O Father, for raising Jesus from the dead. I look to the cross and the sacrifice made there and trust that Jesus was lifted up for me. Thank you! In the name of Jesus, I pray. Amen.